Photo of Dallas Flat Glass Distributing's T270 courtesy of Kenworth. 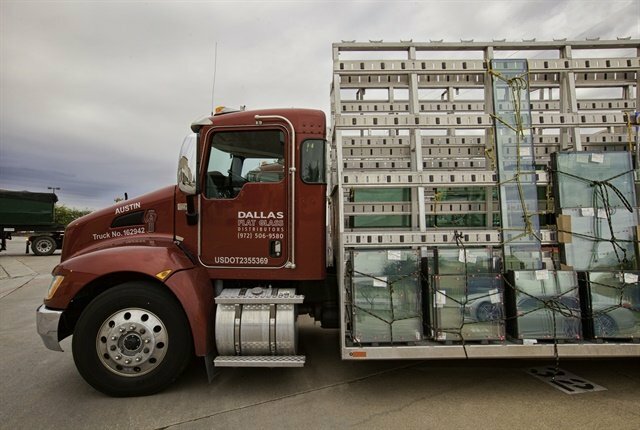 Dallas Flat Glass Distributing has doubled productivity by shifting to a Class 6 Kenworth T270, as part of the fleet's initiative to move away from 13,000-pound Class 3 trucks, the company has told Kenworth. By adopting the larger truck, the company has been able to transport twice as many glass panes, which helps the company respond more quickly, especially after a hail storm. The Carrollton, Texas-based company started buying T270s in 2013 from MHC Kenworth-Dallas. The T270s are equipped with 6-speed Allison automatic transmissions and 350-horsepower PX-9 engines providing 1,000 lb.-ft. of torque. The T270s are equipped with two 56-gallon saddle fuel tanks, which give the trucks a range of more than 750 miles. The new trucks can carry nearly twice as much glass products on 24-foot racks, or 10 feet longer than the racks equipped on the trucks they replaced. Dallas Flat Glass, founded in 2000, operates a 100,000-square-foot warehouse and delivers sheets that vary in sizes from 5-by-6 feet to 13-by-7 feet that weight from 2 to 3 tons each to more than 700 glass companies within a 150-mile radius of the warehouse. The increased productivity has allowed the company to reduce employee overtime. The company has been able to maintain an annual growth rate of 17%.